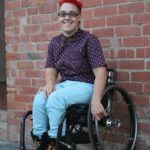 As a disability feminist who is queer, I live intersectionality, it shapes my life and my politics. However, the communities I belong to are often not intersectional or inclusive. The disability community can be very homophobic, biphobic and transphobic. I was reminded of this last week when I posted in a disability forum about a staff member for the National Disability Insurance Scheme who assumed the gender of my partner to be male, and my post was met with homophobic responses from other people with disabilities. In the LGBTIQA community there is often a lack of awareness of people with disabilities, events are routinely held in inaccessible spaces, and when I and others with disabilities have raised access issues with queer event organisers they have often been met with inaction. These access issues mean that many of us can’t get into queer spaces and so are not seen as part of the queer community. We need to get better at intersectionality. We need to be able to talk about behaviour that is problematic, exclusionary or reinforces privilege. Disability does not negate gendered privilege, but often people outside the disability community (as well as those within it) presume that it does, which both saddens and frustrates me. When people see me, the first thing they notice is that I use a wheelchair, then perhaps that I have bright red hair, maybe that I am white, and then maybe my gender. 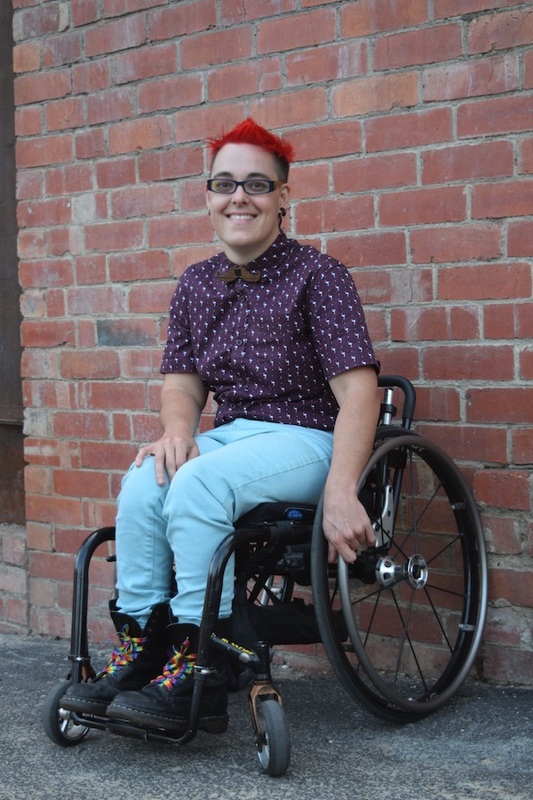 My wheelchair is always one of my key defining features, it takes centre stage in the minds of others and it obscures other aspects of my identity. It is often the thing strangers want to ask me about: “What happened?” “Were you born like that?” “Was it an accident?” to which I have a variety of witty answers which sometimes amuses, sometimes surprises or shocks them, as I consciously resist giving the medical diagnosis of my body to strangers. My disability identity is important to me. I am proud of my body, of how I move through the world and of my social model of disability politics. I don’t want my wheelchair not to be noticed by people, but when people say things like ‘’I don’t see your disability’’ or ‘’I don’t notice your wheelchair’’, while they often intend this as a compliment, it also tells me that they assume disability to be a bad thing which they feel uncomfortable with. Whilst non-disabled people often fail to notice other aspects of my identity other than my wheelchair, within the disability community gendered privilege often has a big influence on our interactions. A recent example of this was when I was on a train in one of two wheelchair spaces in the first carriage (the only carriage wheelchair users can get on) when a man in a power-chair got on and proceeded to swear at me because I was in the space he wanted. He then manoeuvred over into the spot opposite me and continued to swear under his breath. He then did the disability equivalent of man-spreading and reclined his chair back taking up most of both the wheelchair spaces, so that when I came to my stop and needed to wheel past him I couldn’t because he had blocked me in. He had to un-spread to let me past, which he did reluctantly whilst mumbling the F-word again. To be clear, there was a large space between the carriage doors which he could have reclined in without intruding into my space. I posted about this incident on social media saying that his behaviour was aggressive and an example of how gender intersects with disability to increase entitlement to space, and my post was met with people saying ‘’but you don’t know why he behaved the way he did, stop judging him’’. I’m not advocating here that people with disabilities need to be apologetic for the space our wheelchairs or other mobility aids occupy, not at all. However, we can think critically about how we use our bodies and wheelchairs in public space and how this can be a reflection of gender, power, and at times a form of lateral violence towards each other. We need to stop assuming that the actions or behaviours of people with disabilities are just a consequence of their impairments. We need to recognise that there are multiple layers of identity at play which effect the ways in which people with disabilities interact with and are interacted with in the world. We must have empathy for others of course, but we should also adopt a critical, engaged and intersectional approach to our identities and experiences.